Russia’s pending “gay propaganda” legislation hasn’t stopped an all-new lesbian magazine from launching. 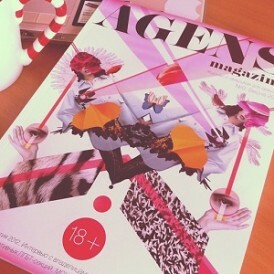 The defying publication, called “Agens,” is described as “A Magazine About Women for Women,” and its name apparently translates to “driving force” in Latin. The print magazine comes with a disclaimer that it’s only for adults, according to the report, and as such is able to circumnavigate the controversial “gay propaganda” laws which ban the “promotion” of lesbian, gay, bisexual and transgender (LGBT) lifestyles to minors. The first issue of the magazine features coming out stories and features on filmmaking, studying abroad, local businesses and androgynous women’s clothing in 120 pages. In addition to being Russia’s first lesbian magazine, it’s the only local LGBT publication in print. Kvir, a Russian gay men’s magazine, previously issued hard copies but is only digital at present. Posted March 12th, 2013 & filed under News.